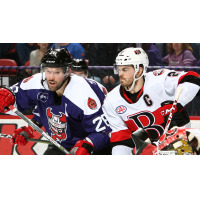 BINGHAMTON - The Binghamton Devils surrendered three goals in the third period in a 5-3 loss to the Belleville Senators at Floyd L. Maines Veterans Memorial Arena on Friday night. Belleville opened the scoring 9:00 into the game after the Devils took a tripping penalty. Senators forward Jack Rodewald had a Nick Paul slap shot deflect off of his skate and into the net with the man advantage for a 1-0 lead. After they were unable to solve Belleville goaltender Marcus Hogberg on consecutive odd-man rushes, the Devils got a good bounce of their own to even the score at one-apiece with 2:52 remaining in the first period. Brandon Gignac's shot from the wall banked off of Nathan Bastian as he crashed the net and found its way past Hogberg. John Ramage registered an assist on the goal as well. Mackenzie Blackwood was called upon to make a save on a 2-on-1 with 45 seconds left in the period and held the game at 1-1 heading into the second period. Belleville took the lead back at 10:36 in the second period as Joseph LaBate redirected Erik Burgdoerfer's shot from the blue line past Blackwood. The Senators lead wouldn't last long, as John Quenneville scored his 16th goal of the season 47 seconds later. Nick Lappin won a battle along the wall and found a wide-open Quenneville in the slot who fired a wicked wrister past Hogberg to make it a 2-2 game. The teams remained tied at two as they horn called an end to the middle frame. Belleville scored 4:38 into the third period on a 4-on-3 powerplay opportunity. Jordan Murray gathered a pass from the circle and fired a wrist shot under the bar and past Blackwood, making it a 3-2 score. The Senators then tacked on a shorthanded goal with 8:14 remaining to take a two-goal lead. Rodewald took a pass from the goal line from Chase Balisy, pulled a toe-drag, and roofed the puck past Blackwood. The Devils fought back to make it 4-3 with just under six minutes remaining in the game, as a bouncing puck found its way to the tape of Lappin, who lifted the puck over a sprawling Hogberg. Josh Jacobs and Ryan Murphy tallied assists. However, Nick Paul beat Blackwood on a sharp angle shot from the boards 1:55 later, giving the Senators another two-goal lead and an eventual 5-3 win. The Binghamton Devils return home tomorrow against Utica for Mascot Mania presented by McDonald's. Join the New Jersey Devils mascot, NJ Devil, and all of Devil Dawg's friends for Mascot Mania at 7:05 p.m. Kids 12 and under get tickets for just $10. Call or text "TICKETS" to 607-722-7367.